Its a classic tale, a few rabid fans get together and try to publish a comic book. They even have a good idea (Jim's Ninja) written by a talented writer (Brendan Hay, Daily Show) and drawn by a gifted artist (Eric Allard). But they also have full time jobs, school, girlfriends, etc... so something gets lost in the process. I won't front, we tried, but life just got in the way, doesn't mean we aren't still trying, just that we all have day jobs, you know how it is. 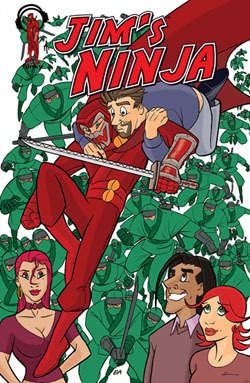 So for now, you'll have to be satisfied reading the first 11 pages of Jim's Ninja, written by Writer Brendan Hay (Daily Show) and drawn by Artist Eric Allard.